How to Convert Audible AA, AAX to MP3 on Mac? Easily convert audiobooks from Audible AA, AAX formats to MP3 formats so they can be played on devices that don't interface with Audible. Audible is a world’s well-known online audiobook publisher and distributor. Acquired by Amazon, it has monopolized a large segment of the digital audiobooks distribution market. The original audiobook files by Audible are in AA or AAX formats. These two formats that are sold and downloaded by users who have an Audible user account, are digitally encrypted (DRM). In other words, only authorized computers or portable players are able to playback Audible’s audiobooks. This is also mainly why many users wish to convert their purchased Audible AA and AAX format audiobooks into MP3 formats. MP3 format file is currently the most widely used audio format that is supported by most audio players and audio processing software. By converting Audible AA and AAX formats into MP3 formats, users can share their audiobook purchases with their family and friends. They can also playback audiobooks on a variety of audio devices such as Android phones, mobile audio players, Walkman, iPhone, tablet PC etc. In summary, you can freely enjoy Audible audiobooks without worrying about format restrictions. So how can user easily convert Audible AA and AAX into MP3 formats on Mac? Audible does not provide such tools or software. 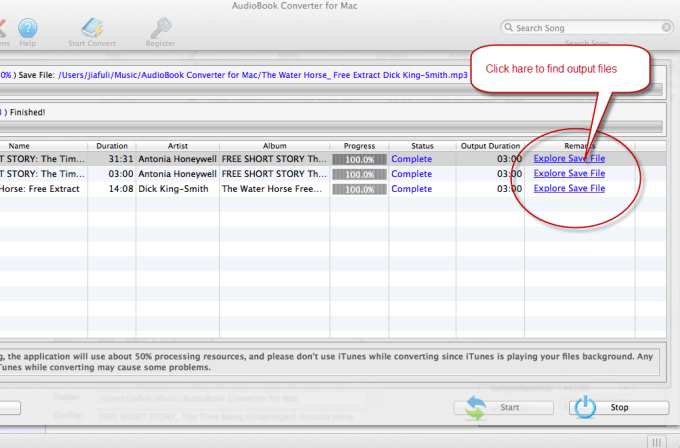 The only way is to use AudioBook Converter, a third party software. It can remove any DRM protection from Audible AA and AAX formats and convert the files into MP3, M4A, AAC or other audio formats. However you need to ensure that the audiobooks you wish to convert are imported into iTunes library and are playable on iTunes. 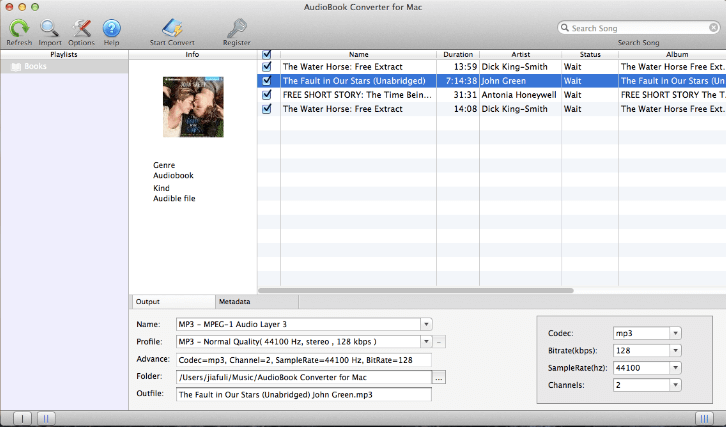 AudioBook Converter supports multiple conversions of Audiobooks without losing sound quality. Conversion speed can be set up to 16 times normal speed, making it very useful to convert long and/or multi-part Audible audiobooks on Mac OS X. Step 1: Launch the application from the Applications folder. The main interface is shown below. Click on “Books” located on the left side of the interface. All your AudioBooks in your iTunes will be shown on the right. You can select the AudioBooks that you wish to convert. Step 2: At the bottom of the interface, you can select the output format and location. Normally we suggest selecting MP3 as the default output format. Other output format such as: M4A, AAC AC3, M4R, MKA, and etc can also be selected according to your own needs. The program default location setting can be used as the output location or it can be changed to any location on the computer to save your audio files in. Click on “Options” icon located at the top of the toolbar to open the preferences’ interface. you can set the conversion speed, rename the output file and adjust other advanced output settings. Step 3: Click on the “Start Convert” icon located on the toolbar to start converting your Audible AA and AAX into MP3 format. Once conversion is completed, select your set destination folder to view the output MP3 files. Tip: For long MP3 files, you can use the MP3 Splitter to split big audio files into separate chapters without losing sound quality. Fully support macOS 10.14 Mojave. You can immediately download the very last version of Audible AA, AAX Converter from our website and start to trial it right now !